Baxter was groomed on Tuesday and 4 days later I still can't stop giggling over his 'fur'cut. We always trim him short, 1. because we think the "lion" cut is adorable, but 2. it's also practical. Penny loves to lick, bite, pull, etc at his fur and when it gets too long it mattes easily because of her nonsense. Last time we took him in, they trimmed him to 1/2", I was a little unhappy because his legs looked really 'poofy' for being trimmed, knowing that by the time he was due for his next cut they'd be out of control, which they were. So we told the groomer do go ahead and cut 3/4". My poor baby boy!.... who knew he had such skinny limbs under all that fuzz. He's the man... we bought clippers and all the tools to do it ourselves and tried it once got halfway through and quit. 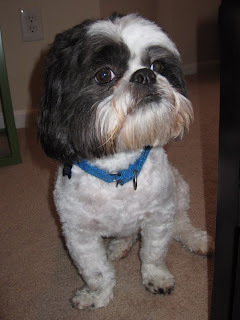 Shih Tzu's have a double coat so it just too forever to cut through with clippers.